Mosquito Lagoon is a body of water located on the east coast of Florida in Brevard and Volusia counties. It is part of the Indian River Lagoon system and the Atlantic Intracoastal Waterway. It extends from the Ponce de Leon Inlet to a point north of Cape Canaveral, and connects to the Indian River via the Haulover Canal. The Mosquito Lagoon Aquatic Preserve includes 4,740 acres (1,920 ha) in the northern end of the lagoon. The preserve originally extended to the southern end of the lagoon, but close to two-thirds of the preserve in the central and southern lagoon were transfered to the Federal government, and is now part of the Canaveral National Seashore. The cities of New Smyrna Beach and Edgewater, the Merritt Island National Wildlife Refuge and the Kennedy Space Center adjoin the lagoon. The Banana River is a 31-mile-long (50 km) lagoon that lies between Cape Canaveral and Merritt Island in Brevard County, Florida in the United States. It is part of the Indian River Lagoon system, and connects at its south end to the Indian River; it is the only part of the lagoon system not in the Intracoastal Waterway. It also has an outlet to the Atlantic Ocean via a lock into Port Canaveral. The lagoon includes salt marshes, mangrove swamps, seagrass beds, drift algae, oyster bars, tidal flats, and spoil islands, providing habitats for many marine species.These are brackish waters mixed of salt and fresh water; waist deep with a soft bottom sand/grass. Commercial and recreational activities in the lagoon generate more than US$ 800 million annually for the local economy. The Wisconsin Glacial Episode, also called the Wisconsinan glaciation, was the most recent glacial period of the North American ice sheet complex. This advance included the Cordilleran Ice Sheet, which nucleated in the northern North American Cordillera; the Innuitian ice sheet, which extended across the Canadian Arctic Archipelago; the Greenland ice sheet; and the massive Laurentide ice sheet, which covered the high latitudes of central and eastern North America. This advance was synchronous with global glaciation during the last glacial period, including the North American alpine glacier advance, known as the Pinedale glaciation. The Wisconsin glaciation extended from approximately 75,000 to 11,000 years ago, between the Sangamon interglacial and the current interglacial, the Holocene. 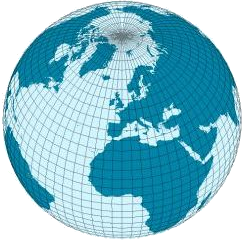 The maximum ice extent occurred approximately 25,000–21,000 years ago during the last glacial maximum, also known as the Late Wisconsin in North America. Lake Okeechobee is connected to the lagoon by the Okeechobee Waterway and the St. Lucie River meeting in Sewall's Point. Crane Creek is a 3.3 miles (5.3 km) long tributary of the Indian River in Melbourne, Florida. Turkey Creek Sanctuary is a county wildlife reserve and nature trail system located along the shores of Turkey Creek. A tributary of the Indian River, in Palm Bay Florida. Turkey Creek (Indian River) is a tributary of the Indian River in Palm Bay Florida. Hobe Sound is the portion of the lagoon from St. Lucie Inlet to Jupiter Inlet. The lagoon contains 35 species listed as threatened or endangered — more than any other estuary in North America. The lagoon has about 2,500 types of animals in it. [ clarification needed ] It serves as a spawning and nursery ground for different species of oceanic and lagoon fish and shellfish. The lagoon also has one of the most diverse bird populations anywhere in America. Nearly 1/3 of the nation's manatee population lives here or migrates through the Lagoon seasonally. Mangroves are important to marine life. Between the 1940s and 2013, 85% of them had been removed for housing development. ↑ Harbor Branch Oceanographic Institution (2018). "Indian River Lagoon - Facts and Figures" (PDF). Fort Pierce, Florida: Floirida Atlantic University. p. 1. Retrieved 29 September 2018. 1 2 "Florida Oceanographic Society - Indian River Lagoon Fact Sheet" (PDF). 1 2 "Indian River Lagoon; An Introduction to a National Treasure" (PDF). Archived from the original (PDF) on 2013-03-19. Retrieved 2013-04-17. 1 2 3 4 5 6 7 8 "A History of the Lagoon". Melbourne, Florida: Marine Resources Council. 2018. p. 1. ↑ Johnston, Larry (May 15, 2016). "What's the history behind a waterway's name?". Florida Today. Melbourne, Florida. pp. 17A. Retrieved May 15, 2016. 1 2 Byron, John (December 29, 2018). "Seven things you might not know about the lagoon". Florida Today. Melbourne, Florida. pp. 10A. Retrieved December 29, 2018. 1 2 3 4 Waymer, Jim (October 13, 2013). "Leaders to discuss lagoon cures during special meeting.Talking solutions". Florida Today. Melbourne, Florida: Gannett. pp. 6A. Retrieved October 19, 2013. ↑ "Website of the St. Johns River Water Management District". sjrwmd.com. Retrieved 1 February 2017. ↑ "www.indianriverlagoon.com". indianriverlagoon.com. Retrieved 1 February 2017. ↑ "IRL Health Update: 2018 Report - Marine Resources Council". savetheirl.org. 23 July 2018. Retrieved 7 August 2018. ↑ "You are being redirected". sjrwmd.com. Retrieved 1 February 2017. 1 2 3 4 "January 2017". 2017 Calendar. 2017. ↑ Soper, Shawn J. (May 6, 2011). "Dolphin 56 Back Dazzling Boaters In Ocean City". The Dispatch (Ocean City, Maryland). Retrieved 6 June 2012. ↑ "Fishing the Indian River Lagoon from Titusville Florida". abouttitusville.com. Retrieved 1 February 2017. ↑ KENNEDY DUCKETT, MARYELLEN (2015-02-10). "Florida by Water: Experience Bioluminescence" . Retrieved 31 July 2018. 1 2 3 Hanisak, M. Dennis (1997). "Continuous Monitoring of Underwater Light in Indian River Lagoon: Comparison of Cosine and Spherical Sensors". In: EJ Maney, Jr and CH Ellis, Jr (Eds.) the Diving for Science…1997, Proceedings of the American Academy of Underwater Sciences, Seventeenth Annual Scientific Diving Symposium. Retrieved 2009-04-02. ↑ Dawes, Clinton J.; M. Dennis Hanisak; Judson W. Kenworthy (1995). "Seagrass biodiversity in the Indian River Lagoon". Bulletin of Marine Science. 57 (1): 59–66. Retrieved 2009-04-02. ↑ Ned P. Smith (2016). "Transport pathways through southern Indian River Lagoon". Florida Scientist. 79 (1): 39–50. ISSN 0098-4590. JSTOR 44113179. ↑ "Editorial:Dying dolphins". Melbourne, Florida: Florida Today. 22 May 2010. pp. 13A. ↑ Waymer, Jim (April 25, 2013). "Panel approves $1.2 million in lagoon projects". Florida Today. Melbourne, Florida. pp. 2B. ↑ Waymer, Jim (September 8, 2013). "Lagoon crab catches dwindle". Florida Today. Melbourne, Florida. pp. 1A, 3A. Retrieved September 13, 2013. ↑ Waymer, Jim (September 29, 2013). "Do something!". Florida Today. Melbourne, Florida. pp. 4A. ↑ Berman, Dave (March 20, 2016). "Some issues remain half century later". Florida Today. Melbourne, Florida. p. 11. ↑ "Visitors spend big on the lagoon". Indian River Lagoon Update. XVI (3): 1. Summer 2008. Brevard County is a county in the U.S. state of Florida. As of the 2010 census, the population was 543,376, the 10th most populated county in Florida. The official county seat has been located in Titusville since 1894. Brevard County comprises the Palm Bay–Melbourne–Titusville, FL Metropolitan Statistical Area. It is located along the east Florida coast and bordered by the Atlantic Ocean. 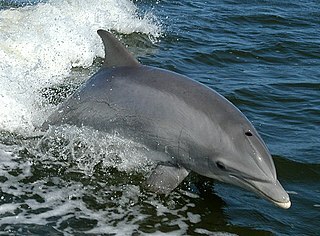 The common bottlenose dolphin, or Atlantic bottlenose dolphin, is the most well-known species from the family Delphinidae. Lake Okeechobee, also known as Florida's Inland Sea, is the largest freshwater lake in the state of Florida. It is the eighth largest natural freshwater lake in the United States and the second largest natural freshwater lake contained entirely within the contiguous United States. Okeechobee covers 730 square miles (1,900 km2), approximately half the size of the state of Rhode Island, and is exceptionally shallow for a lake of its size, with an average depth of only 9 feet. The Kissimmee River, located directly north of Lake Okeechobee, is the lake's primary source. The lake is divided between Glades, Okeechobee, Martin, Palm Beach, and Hendry counties. All five counties meet at one point near the center of the lake. Sebastian Inlet State Park is a Florida State Park located 10 miles south of Melbourne Beach and 6 miles north of Vero Beach, Florida. The park lies on both sides of the Sebastian Inlet, which forms the boundary between Brevard and Indian River counties. The land for the park was acquired by the state of Florida in 1971. In 2010, it was the second most visited state park in Florida. Sebastian Inlet, located in Sebastian Inlet State Park in Brevard County, Florida and Indian River County, Florida, offers surfing and fishing opportunities. It is off State Road A1A just 12 miles north of Vero Beach. There are annual surf tournaments, professional and amateur. Visitors fish there, particularly for Snook and Redfish. Laguna de Términos is the largest and one of biologically the richest tidal lagoons located entirely on the Gulf Coast of Mexico, as measured by water volume. Exchanging water with several rivers and lagoons, the Laguna is part of the most important hydrographic river basin in Mexico. It is important commercially, as well as ecologically by serving as a refuge for an extensive number of flora and fauna; its mangroves provide an important role as a refuge for migratory birds. The Indian River is a 121-mile (195 km) long brackish lagoon in Florida, and is part of the Indian River Lagoon system, which in turn forms part of the Atlantic Intracoastal Waterway. Lake Poinsett is a lake in Brevard County, Florida, United States, near Rockledge and Cocoa, with small portions in Orange County and Osceola County. It is the second-largest lake in Brevard County, after Lake Washington, though it is actually the smallest lake in Osceola County. It is the widest lake in Brevard County, with a distance of 5 miles (8 km) at its widest point. At the eastern portion of the lake, a channel connects the lake to Lake Florence and Barnett Lake. The St. Lucie River is a 7-mile-long (11 km) estuary linked to a coastal river system in St. Lucie and Martin counties in the Florida, United States. The St. Lucie River and St. Lucie Estuary are an "ecological jewel" of the Treasure Coast, central to the health and well-being of the surrounding communities. The river is part of the larger Indian River Lagoon system, the most diverse estuarine environment in North America with more than 4,000 plant and animal species, including manatees, oysters, dolphins, sea turtles and seahorses. Environmental issues in Brevard County in Florida United States are highlighted by the amount of waterline, the amount of wetlands, the quantity of residents and visitors to the area, as well as the usual threat to air quality from commuters. Assisting in this is the Florida Space Coast Clean Cities Coalition which headquartered in Brevard. It encompasses a nine-county area. Eau Gallie River is a 3.9-mile-long (6.3 km) river in Eau Gallie, Florida, United States. It is a tributary of the Indian River, with its mouth near Hawthorne Point. The Atlantic needlefish is a common demersal needlefish species common in marinas and other areas with minimal currents. Its extremely long jaw and body set this fish apart from other predators. Atlantic needlefish are found from Maine to Brazil and have been known to venture into fresh water for short periods. The History of Brevard County can be traced to the prehistory of native cultures living in the area from pre-Columbian times to the present age. Brevard County is a county in the U.S. state of Florida, along the coast of the Atlantic Ocean. The geographic boundaries of the county have changed significantly since its founding. The county is named for Judge Theodore W. Brevard, an early setter, and state comptroller. The official county seat has been located in Titusville since 1894, although most of the county's administration is performed from Viera. The St. Lucie Canal (C-44) is a man-made canal built in 1916 in Martin County, Florida to divert floodwaters from Lake Okeechobee via the canal to the South Fork of the St. Lucie River and into the St. Lucie Estuary, a component of the Indian River Lagoon, which connects to the Atlantic Ocean. Resulting from this connection, restoration projects in the St. Lucie River are the northernmost component of the Comprehensive Everglades Restoration Plan. The Rivers Coalition is an advocacy organization started in 1998 and based out of Stuart, Florida working on behalf of the St. Lucie River, St. Lucie Estuary, and Indian River Lagoon to stop the adverse environmental and economic effects of the U.S. Army Corps of Engineers discharges into the St. Lucie River from Lake Okeechobee. Stolen, Megan K.; Barlow, Jay (October 2003). "A Model Life Table for Bottlenose Dolphins (Tursiops truncatus) from the Indian River Lagoon System, Florida, U.S.A." (PDF). Marine Mammal Science.19(4). pp. 630–649. Wikimedia Commons has media related to Indian River Lagoon .